Looking to keep your lawn weed-free and your plantings protected from heavy rain? Mulching is critical to maintaining the landscape you love and keeping your gardens and grasses healthy—especially in Northern Virginia, where we often experience periods of wet, rainy weather. Fortunately for residents of Great Falls, the City of Falls Church, North Arlington, McLean, and Vienna, O’Grady’s Landscape offers a comprehensive mulching service to meet your needs. So if you want to keep your landscape protected and your plants healthy, let us help. Call us today at 703-533-5001 to schedule mulching in Northern Virginia and we’ll do everything we can to keep your landscape beds looking their best year-round! When it comes to mulching in Northern Virginia, it’s important to choose a landscape company with experience, as poor mulching can often lead to insects, disease, and a number of other issues—which is exactly the opposite of what you want from a landscape maintenance service! Fortunately, O’Grady’s Landscape understands how critical it is to use proper mulching techniques to achieve the desired results. We strive to perform a thoughtful, thorough service, drawing on years of experience to mulch your planting beds and lawn area. So if you want to promote plant health and keep the weeds at bay, our mulching service is for you. And if you’re looking for a full-service landscape maintenance package, we can help you with that too. Our landscapers specialize in pruning, weeding, and fertilization services—but you can read all about it here! Your lawn and plantings define the look of your property, offering color and visual interest amidst your outdoor living spaces. 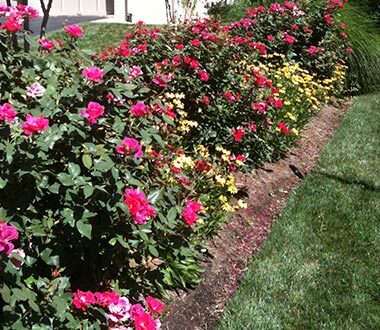 But it isn’t always easy or fun to mulch flower beds on your own—and because improper use of mulching techniques can have damaging results on your plantings, it can be risky too. If you live in Great Falls, McLean, the City of Falls Church, North Arlington, or Vienna, know that you can always count on O’Grady’s Landscape to take care of your mulching needs so you won’t have to—call us today at 703-533-5001 or fill out an online contact form and we’ll get back to you with an estimate fast!